On Saturday, Proud Boy attended a Patriot rally in Seattle as a response to Initiative 1639, a proposed ballot measure that would enact a string of gun regulations including raising the age to purchase semi-automatic rifles to 21 and creating standards for secure gun storage. Unfortunately, as expected, masked Antifa thugs showed up. And where is Antifa, there are problems. After protesters left Juno, an altercation between the two groups started. At that point, Proud Boys protestor pulled down Antifa protestor’s bandana. 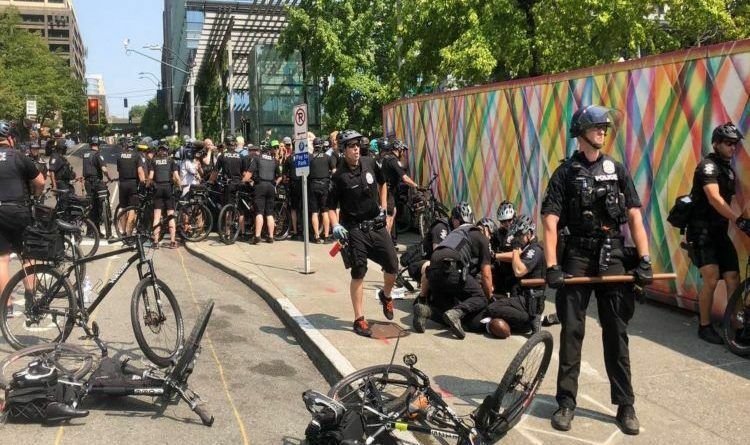 Luckily, Seattle police is actually enforcing a law against Antifa. Seattle PD arrested a man who was with the Antifa group who followed the proud boys into that Seattle restaurant. Finally, something is done! Antifa is fascists who claim they are Anti-Fascists. This is why ANTIFA hides their identities. They know they are terrorists. They are Criminals and need to be arrested. A little bit slow but this is how it should be. Hope they arrest them every time they protest. The perpetrators must be exposed and prosecuted. Let’s share this news everywhere because the MSM will never report this!